Spotted this regional jet during an East Coast trip. JetBlue operates 60 of these ERJ-190s in their current fleet, they are to be replaced by A220-300 and A321neo starting in 2020. The Embraer E-jet family has been a commercial success, efficiently serving lower-demand routes while offering many of the same amenities and features of larger jets. More than 550 of this variant have been delivered. 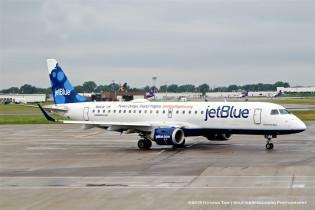 The first flight of the E190 was in March 2004 with JetBlue as the launch customer with 100 ordered in 2003 and first delivery in 2005. Fuji X-E2s w/18-55mm.